Ford Mondeo 2011 receives a comprehensive update with enhancements to interior, exterior, driving experience and performance. The new Mondeo introduces two new high-efficiency trains: a new 240 PS version of the Ford EcoBoost 2.0-litre turbo petrol engine and a new 200 PS 2.2-litre Ford Duratorq TDCi diesel. Also, new to Mondeo is the latest double wet-clutch Ford Powershift transmission technology that offers smooth, effortless driving pleasure. 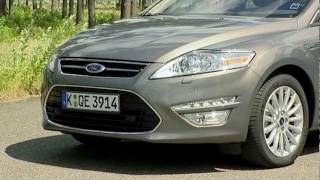 Check out the different models for Ford Mondeo: 4-Door Sedan, 5-Door and a Wagon, after the jump. S-MAX and Galaxy models. New designs, powertrains and technologies deliver greater driving pleasure and lower CO2 emissions, as well as a more premium feel and even more comfort and safety. S-MAX and Galaxy, but offers even more. Underneath its sophisticated and sporty new design is a host of all-new technologies including Lane Departure Warning, Auto High Beam and Driver Alert, and an even broader range of new high- efficiency petrol and diesel engines and new Ford ECOnetic technologies. 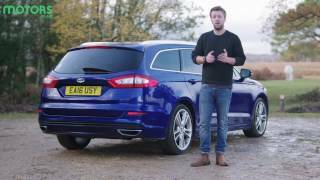 Mondeo is already a very strong package but with the changes we are introducing for 2011 we have created our most technologically advanced Mondeo ever, deserving of its role as the flagship Ford model in our European line-up. Alongside the new C-MAX coming later in 2010 and the next-generation Focus early in 2011, the new Mondeo comes at the start of a very demanding period in Ford's aggressive new product schedule." 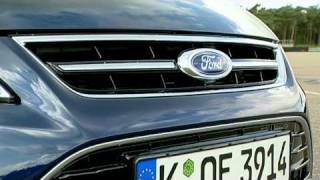 Ford of Europe is launching the most stylish and technologically advanced Mondeo model ever. With a fresh, restyled exterior, an enhanced interior, plus new high-efficiency Ford EcoBoost petrol and TDCi diesel powertrains and a host of new driver comfort and convenience features and safety technologies, the new Mondeo completes the rejuvenation of Ford's large car range, and takes its position as the flagship model in the company's European portfolio. The Mondeo interior has also benefitted from a comprehensive rework with changes to the centre console and door panels, plus a range of new, high quality materials. The latest Mondeo also introduces a comprehensively revised version of the 2.2-litre Ford Duratorq TDCi diesel engine, which boasts a 12 per cent power increase to 200 PS, making it the most powerful Ford Duratorq diesel engine so far. Ford ECOnetic Technologies are also applied to the new Mondeo range to enhance efficiency and economy, and include new features like Smart Regenerative Charging, the Ford Eco Mode driver information system and – a Ford first – an Active Grille Shutter system. Driver assistance, comfort and convenience features abound in the new Mondeo and many of these are appearing for the first time in a Ford model, including systems for Lane Departure Warning, Driver Alert and Auto High Beam. 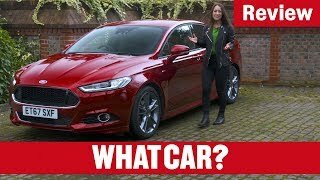 The new Mondeo is set to build on the model's established reputation as a stylish, versatile and great-to-drive vehicle, and for offering high levels of driving enjoyment and comfort to its occupants. Central to this is the application of a fresh look for all three body styles, four-door, five-door and wagon, to distinguish the new model. Ford's design team set out to emphasise further the kinetic design signatures in each body style while incorporating new technologies such as LED lighting. Bolder graphics and proportions at the front end, including larger lower trapezoidal and slimmer upper grilles, plus a revised bonnet profile and integral new LED day running lights further emphasise the Mondeo's premium appeal and sporty stance. New Mondeo's sleek lines are emphasised in the side profile by a new, full chrome window surround for the higher series models, while larger, re-designed, LED tail lamps give additional kinetic movement to the rear. Overall the revised exterior design for new Mondeo complements its premium feel and enhanced quality while hinting strongly at the model's sporty dynamics and performance. The interior of the new Mondeo has also been comprehensively reworked to give it a higher level of quality and sophistication through meticulous attention to detail, and by employing new, higher quality trim materials. The re-designed centre console flows more elegantly, while the door panels feature a new 'toproll' and flush, integrated, door release mechanisms. Further enhancements include a new central overhead console featuring LED ambient lighting, and a woven headliner. The use of new high quality interior trim materials in new Mondeo boost the overall feeling of craftsmanship and are complemented by high-class inlay foils and new 'jewel' detailing on switches and vents in satin chrome. New interior colour schemes also offer two new lighter interior executions for a rich, premium, appeal. 265 Watts, an all-new speaker system, which includes an instrument panel-mounted centre unit and a large 17-litre subwoofer located in the luggage compartment. The new Mondeo offers a wide range of Ford's latest high-efficiency powertrain technologies, delivering a key combination of fuel efficiency and low emissions, yet still maintaining Ford's renowned driving enjoyment. The range includes Ford EcoBoost petrol, Duratorq diesel and E85 Bio ethanol Flexifuel options. Lightweight all-aluminum construction is the key to the new 2.0-litre Ford EcoBoost engine, which features latest-generation high-pressure direct injection, low-inertia turbocharging and twin independent variable cam timing. It has an advanced combustion system which contributes significantly to achieving new levels of performance and fuel efficiency for petrol engines in this power range. Average CO2 emissions of just 179 g/km are achieved for the 2.0-litre Ford EcoBoost engine, regardless of the power rating or body style. Ford EcoBoost technology offers fuel consumption and emission reductions of up to 20 per cent compared with conventional petrol engines of a similar performance. 200 PS, making it the most powerful Ford Duratorq diesel to date. This new powerhouse is joined by the significantly improved 2.0-litre Duratorq TDCi diesel introduced to the Mondeo range earlier this year, and available with 115, 140 or 163 PS power ratings, all three of which deliver average CO2 emissions of just 139 g/km with a six-speed manual transmission and regardless of body style. Existing 1.6- and 2.0-litre Ford Duratec petrol engines have also been retained, offering 120 and 145 PS outputs. For customers seeking a Flexible Fuel option - capable of running on a selection of fuel from regular petrol to E85 bio ethanol - the 2.0-litre petrol engine can be specified. New 1.6-litre engines from the Ford EcoBoost petrol and Duratorq TDCi diesel engine families will be available in the future to extend the wide powertrain choice even further. 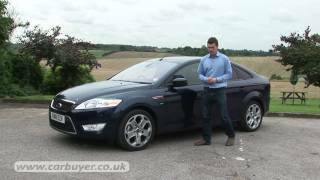 New Ford ECOnetic Technologies are also available on new Mondeo to help ensure efficient and economical motoring. Innovations include Smart Regenerative Charging, the Ford Eco Mode driver information system and, for the first time in a Ford model, an Active Grille Shutter system. This electronically controlled device regulates the airflow through the radiator and engine compartment, reducing aerodynamic drag and benefitting engine heating characteristics to improve fuel economy and warm-up performance, particularly in cold climates. Powertrain advances seen in the new Mondeo also extend to the transmission, with the latest Ford PowerShift double wet-clutch transmission system fitted as standard equipment with Ford EcoBoost petrol engines and available as an option with 140 PS and 163 PS versions of the 2.0-litre Duratorq TDCi. The new Mondeo range is packed with available technologies to provide customers with even higher levels of comfort and confidence. A wide range of the latest driver assistance technologies includes Lane Departure Warning, Driver Alert and Auto High Beam, all of which utilise a new high sensitivity camera unit located at the top of the windscreen in front of the rear view mirror. Also extending to Mondeo are many features already introduced on the latest S-MAX and Galaxy models, including Ford's Blind Spot Information System, Speed Limiter, Rear Door Power Child Locks and Rear View Camera. LED lighting technology is used for the daytime running lights and rear tail and brake lamps as well as inside the car. "The design, technology and quality advancements we are delivering with the new Mondeo demonstrate the key role this model plays in our European range. The progress we have achieved in fuel economy and emissions through our Ford EcoBoost petrol and Duratorq diesel engines, as well as the introduction of new Ford ECOnetic Technologies, prove that customers can safely continue to choose a large car – from any of three bodystyles - without feeling the need to sacrifice on space, performance, driving enjoyment or the selection of driver assistance technologies."